A beautiful seaside city, Saint John is a stunning example of the Maritime’s unique culture. The city is mostly walkable and tourist-friendly, and comes alive during the summer. Along with many summer festivals in the city, there are many locations close by that you can explore or just visit to get away from city life. 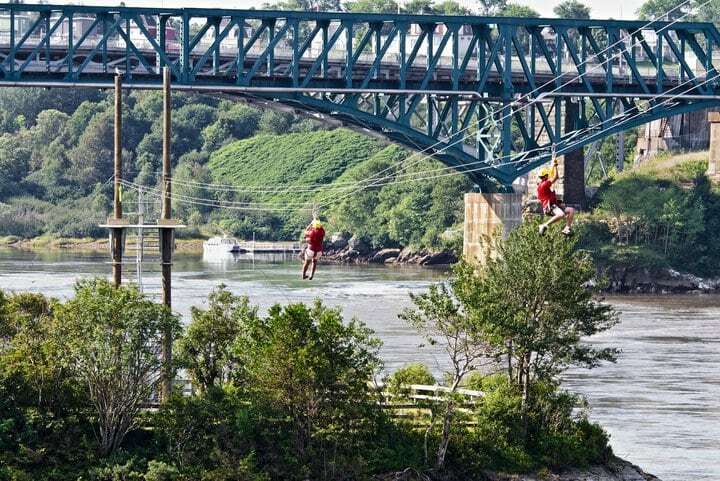 So, get ready for summer with our list of 45+ things to do in and around (1 hr) Saint John. Each weekend from June until the end of September, the parking lot at East Point Shopping becomes filled with the best food trucks in Saint John. Food Truck Weekends at East Point Shopping is the perfect place to get lunch, dinner, or snack when you are at the East Point Shopping Centre. On top of the Reversing Falls Rapids Tourist Centre is the Skywalk Saint John walk away, which will take you over the Reversing Falls Rapids. Along with the walk-away, there is a 13 minute film explaining the Reversing Falls Rapids phenomenon, geology, and the history of the area. Enjoy East Coast talents, New Brunswick Talent Tuesdays, Saint John Idol competitions, Sunday Jazz and more this summer at the Square! East Coast Games is the largest multi-sport tournament to be held in Saint John since the 1985 Canada Games. The games started in 2015 with 7 sports, and has grown to 13 sports with over 2000 athletes completing. The games have participants of all ages competing in a variety of team and individual sporting events, as well as participating in a coaching symposium. June 22 – 24, 2018. Explore New Brunswick’s unique history at this museum. Along with artifacts, New Brunswick Museum is also an art gallery for local artist. The most popular exhibit is the Hall of Great Whales. Explore 2.4km of the historic Saint John with a nationally-certified guide for about 2 hours with the Shore Excursion Saint John Walking Tour. Learn about over 400 years of history about Canada’s oldest incorporated city. You can leave at any point to head back to the start or stay with the tour the whole time. Leave your worries behind and surround yourself with the beauty of Hampton’s wetlands on the 26’ by 10’ eco-friendly pontoon boot. You can relax and enjoy nature on the slow-moving waves of the Kennebecasis River. The Eco-tour with Zelda’s River Adventures are usually 2 to 3 hours long. Explore one of Canada’s Largest Urban Municipal Parks with a customized day adventure. The Inside Out Nature Centre focuses on creating a great experience for your time outside, no matter your age or ability. A visit to the Nature Centre is the perfect way to spend a summer day. Meet the Mysterious Mistress Grant and tour the most haunted places in Saint John by taking the Haunted Saint John Tour. This unusual tour is available once a week during the summer and fall. When you take this tour, you will learn the history of each location and hear accounts of the paranormal happenings around the area. Enjoy free activities organised by Lily Lake Pavilion Inc., on Tuesday nights at Rockwood Park. Activities include movies, yoga and more! Watch the extreme power and competitiveness of the Lumberjacks and Lumberjills from the Maritime Provinces, Quebec and the New England States on July 7, 2018. Disconnect from your phone and computer screens and spend some time with family and friends playing a board game. There are over 800 games at the Offline Board Game Café for you to play. They also have snacks and drinks that you can purchase and enjoy during your games. Just a few minutes outside of uptown Saint John is the Cherry Brook Zoo Inc. Over 35 species of animals call the zoo home, including snow leopards, zebra, tigers, lions and an African Porcupine. You can also visit the Vanished Kingdom Park and play golf at the Tiger Claws Miniature Golf Course when you visit the zoo. Watch the Reversing Rapids’ whirlpools and waves below as you zip along at the Saint John Adventure Zipline. There are five lines to pick from to travel across at around 40km/hr. The Signature Zip is 670 feet across the water. Spend 6 hours on the Saint John Photography Tour and travel to the most photographic locations in and around Saint John. You can capture the beauty of the waterfront, local farmer’s markets, bridges, and much more. Saint John’s premiere festival for all things pop culture is the Fundy Fan Fest. Celebrate your favourite fandoms and meet new people who love the same things that you do. You can attend panels on subjects that interest you or get your picture taken professionally with your favourite celebrity. There is something for everyone at the Fundy Fan Fest. The Saint John City Market has been operating since the late 1700’s and is the oldest continuing farmer’s market in Canada. If you look upwards, you will see that the ceiling resembles an upturned hull of a ship as a tribute to the city’s shipping industry. The market is open from Monday to Saturday, and has something for everyone. Area 506 festival will be held on the Saint John waterfront over the New Brunswick Day long weekend, beginning Friday, August 3rd and running until Monday, August 6, 2018. This year has deepest lineup yet, featuring Arkells, July Talk, Big Wreck,The Glorious Sons and many more. Meet Constable George who is dressed in a uniform based on police officers in 1849 at the Saint John Police Museum. You can take photos in the 1965 Volkswagen traffic car or in the jail cell. The Police Museum makes learning about the history of policing fun and interesting way. Hike, rock climb, zip, and cruise your way around the Stonehammer UNESCO Global Geopark while you are learning about the Earth. The landscape is unique and was created by continents colliding, along with earthquakes, ice ages, and volcanoes. A cozy café in St. Andrews is the perfect place to stop for a break while you are exploring this beautiful town. You can enjoy a hot or cold beverage along with a scrumptious freshly baked snacks at the popular Honeybeans Coffee House. Blueberry Hill Nature Preserve is 19.8 hectares and covers the easterly shoreline of the St. John River. It is one of the last undeveloped properties in the area, and is home to variety of animal species. There isa trail that will take you around the nature preserve where you can spot animals and plant species. Just 15 minutes outside of Saint John is the historic Mispec Park and Mispec Beach. The park was used as a recreation area for servicemen and women during WWII. Mispec Beach is one of the finest sandy beaches on the Bay of Fundy. The beach is unsupervised, so you should always be sure to make note of the tide times. Lying just off the shore is the part-time island of Ministers Island. During the low tide, you can walk or drive 1km over the seafloor to the island. Once you reach the island, you will travel back in time to the late 19th to the early 20th century at the summer estate of Sir William Van Horne, the president and driving force behind the Canadian Pacific Railway. You will almost believe that time almost stands still on the island. Spend time at one of the best playgrounds in Canada at the St. Andrews Creative Playground. The playground was designed by Robert S. Leathers, and has amazing items like wooden structures, slides, climbing areas, and swings to play on. Take time and enjoy the 27-acre Kingsbrae Garden and its collection of over 50,000 perennials in many themed gardens. It has been ranked as one of the top 10 gardens in Canada. Along with walking the gardens, you can also play croquet or bocce or grab lunch at the Savour in the Garden restaurant. One of nine remaining Martello Towers, small defensive forts built by the British Empire and is a National Historic Site. During your visit, you can explore both the interior and exterior of the Tower and find a reconstruction of a 19th century barrack room. The Carleton Martello Tower is about half a kilometer from the Reversing Falls. The Loyalist House was built in 1817 and was originally owned by Thomas Merritt, a British Loyalist. Today, the Loyalist House is filled with authentic 19th century décor. Explore the house on your own, or tag along with the guided tour. Take dip at the swimming pool at the Canada Games Aquatic Centre, or try one of the over 40 different classes that are offered each week. The centre was built to host the 1985 Canada Summer Games and has a Olympic-sized indoor pool, two leisure pools and two waterslides. Find the weirdest, newest and classic candies from across the world, along with pop culture items at Freak Lunchbox in Uptown Saint John. Become a kid at the kid shop and make your own mix of penny candies. You are never sure what you are going find at Freak Lunchbox. A short drive outside of Saint John is the lovely Irving Nature Park. This 600 acre park features amazing views of the Bay of Fundy, a beach, a bog, a salt marsh and a forest. There are approximately 250 different species of birds that stay in the park, so it is a great spot for birdwatchers. Take a tour and indulge your sweet tooth at the Chocolate Museum located at the old Ganong Brother Chocolate factory. You will learn about the history of the Ganong family and how chocolate is made. Peek into the studio where the world famous Hand Dippers are still used to make chocolate like they have been for over 100 years. After visiting the Chocolate Museum, you may want to try more Ganong Chocolate. The Ganong Chocolatier store is where you will find many old-fashioned chocolate varieties which have been made for over half a century. Cross the St. John River on one of the cable ferries that have been used since the 1900’s to visit Gagetown. The town was named One of Canada’s 10 Prettiest Towns by Harrowsmith Country Life. An interesting fact thatGagetown was the original capital of New Brunswick. Travel faraway places on your plate. Diversity of cuisine has been a part of the Canadian Experience at Gulliver’s World Café, and their menu makes use of local, seasonal ingredients. Their menu changes for different cultural themes almost monthly, so their customers can experience a sumptuous trip around the world when they dine there. Explore the colorful and vibrant lives of the woodsmen who called the forest in Central New Brunswick their home. The Central New Brunswick Woodsmen’s Museum is 15 acres and displays authentic tools, photographs, documents, and charts of the area. St. Andrews Blockhouse National Historic Site harkens back to the War of 1812, when Canada and the USA were not so friendly. The blockhouse was built by the townspeople to protect St. Andrews from the Americans attacks during the war. An hour and a half drive east of the city is one of the last remaining wilderness areas in southern New Brunswick. Fundy National Park sprawls out along the Bay of Fundy. During the low tides, you can walk along the muddy crimson beaches. A unique blend of old and new, the Port City Royal is perfect place to stop for a meal. The menu changes nightly, so there is always something new to try. The dishes are made in small batches using local, seasonal ingredients. Make sure to visit early because they are known to sell out and make no apologies for that. Watch a movie under the stars at the only Drive-in Theater in Southern New Brunswick. The Sussex Drive-in is open every Friday, Saturday and Sunday night from late May to September. You should be sure to look out for the Triple Bills that take place on long weekends, especially if you are looking to get the best deals. Built in 1991, this giant axe is a gleaming symbol of the area’s industrial history. The chromed blade of the axe is made from a solid 55 tons of steel and is 23 feet long. The handle extends another 50 feet into the air. The stump the axe is embedded in is also used as a stage for theater and musical performances. Named after the World’s Largest Axe, the Big Axe Brewery, Saloon and B&B opened in December 2012, and has been expanding ever since. When you stop in, be sure to try the unique brews on tap at the saloon or take a break for the night at the B&B. The property overlooks the Saint John River, so there are breathtaking views from each of the buildings. The best way of taking in the Bay of Fundy is by following the Fundy Trail Parkway. The trails are multi-use and will take you around the coast and to a number of look-outs. There are a number of inclines, which make it a challenging hike or bike ride at times. There is also an Interpretive Centre on-site where you will find original artifacts and old photos from a bygone era, when logging, fishing and shipbuilding were an economic mainstay of this region. TimberTop Adventures is a treetop aerial adventure park that has 8 courses where you can test your skills. The park is opening in June 2018. Enjoy this unique celebration of chocolate; rich in culture, delightful to the senses and offering an unforgettable experience during August.